We only stayed in Cabo for a day. It was just time to move on. Our friends Gary and Becky Bell (from Tahoe) were in Los Barriles, not to far away, so we got a hold of them and hoped to meet them in either Los Frailes or Muertos. 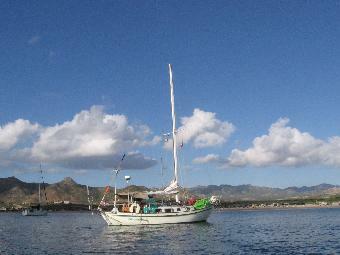 When we left Cabo we left with Marvin and Donna on "Endless" and had a good sail to Los Frailes. It was only about 45-50 miles so we made it with plenty of light. We ran into "Wyntersea" and "Toketie" at anchor. It was good to see them again after all this time. The next day we went to shore and met a bunch of the campers that come to this wonderful place and camp on the beach. There's a little fishing village there but on this day they were all in the town which was quite a ways away. Some Canadian campers offered us some fresh fish they had just caught and anther camper offered to cook it for us... Wow! what a day. Later David and Linda of "Toketie" and us all got together on "Wyntersea" for some appetizers and had a great time. We all decided to leave together for Muertos Cove the next day. We heard some northerlies were on the way and we wanted to beat them there. Dang dude,you lost some weight!